Gov. Peter Shumlin speaking to the Vermont Pension Investment Committee on the issue of divestment. Gov. Peter Shumlin won a promise from the state treasurer and the Vermont Pension Investment Committee that they would consider his call for divesting from coal and ExxonMobil stocks. The governor proposed divestment in his State of the State speech in January. Treasurer Beth Pearce has pushed back, saying that decisions about pension investments should be based on financial criteria, not political considerations. Representatives of organizations lobbying for divestment welcomed the thawing in the stance that Pearce and the panel had taken. “I see it as progress, although not as fast as any of us who support this want to see,” said Paul Burns, executive director of the Vermont Public Interest Research Group. Shumlin opened his speech to the pension committee with a conciliatory message about his differences with Pearce: “She and I share our concern for our planet." Shumlin focused first on ExxonMobil, which he noted had spent millions of dollars on advertising to sow doubt about climate change, while at the same time its own research showed that climate change was real. If the committee wasn’t persuaded to act by this moral case, he urged them to look at the stock’s underperformance in recent years. 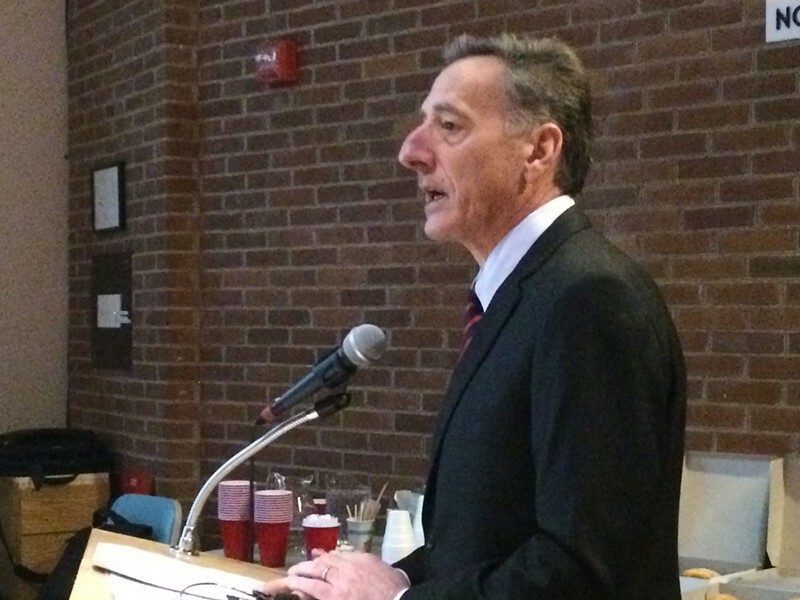 Shumlin reminded the committee that the state has divested from problematic investments in the past. In the 1980s, Peter Welch, then a state senator, pushed through a bill that Gov. Madeleine Kunin signed, requiring divestment from companies doing business in South Africa. In the 1990s, then-treasurer Jim Douglas got rid of $21 million in tobacco stocks. And in 2007, then-treasurer Jeb Spaulding divested from businesses operating in Sudan. “Divestment in Vermont has been a seldom-used, but necessary tool to confront major challenges and put us on the right side of history,” the governor said. Shumlin wants the pension committee both to divest and set up a “screen” that identifies bundled blocks of stock that include coal companies, so the state can avoid those in the future. Tom Golonka, chair of the Pension Investment Committee, suggested that such filters could be expensive to create. He said the cost could go as high as $3 million. Pearce echoed this concern. Shumlin interrupted. “It is always easy to find obstacles to pressing change,” he said. He suggested the Vermont panel considering moving its money, if it can’t persuade its money managers on Wall Street to give Vermont a good deal to create screens for coal companies. The Senate Government Operations Committee is likely to vote on a divestment bill after the legislature’s one-week Town Meeting break. “We will be in touch,” Golonka responded. Correction February 23, 2016: An earlier version of this story misidentified the chair of the Vermont Pension Investment Committee. His name is Tom Golonka.